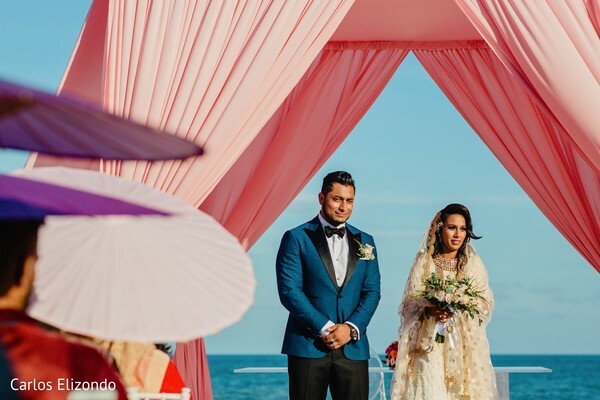 After the prettiest beachfront ceremony, Sara and Ifte went for the second round of insanely cute shots caught by the talented Carlos Elizondo during the most romantic hour of the day! 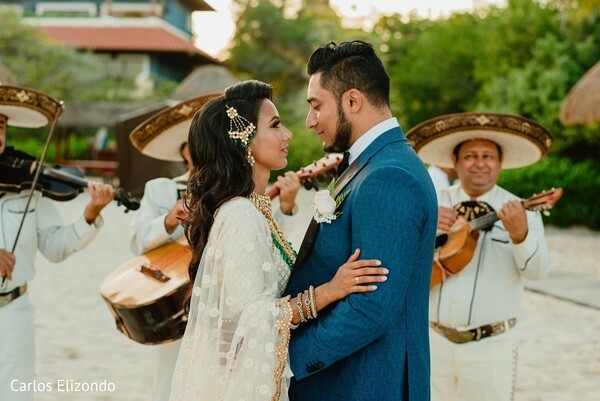 Afterward, they headed to celebrate their love in a captivating outdoor reception at the marvelous Cancun resort, the exclusive Iberostar Paraiso Beach. 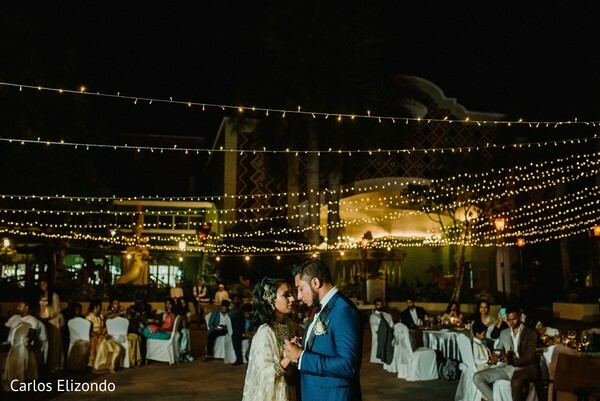 A starry night helped to illuminate the night and the contemporary yet charming sweetheart stage was also illuminated by Iberostar Paraiso Beach with lots of string lights to achieve the perfect outdoor inviting ambiance! 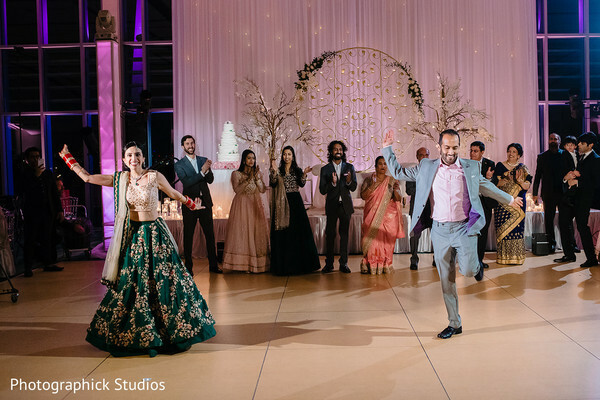 Red Carpet Affairs ensured that their event came off as desired arranging it from start to finish while DJ MK made sure everyone danced all night long! Sahara Cocina made everyone experience an exceptional culinary event to wrap up the celebrations just right! 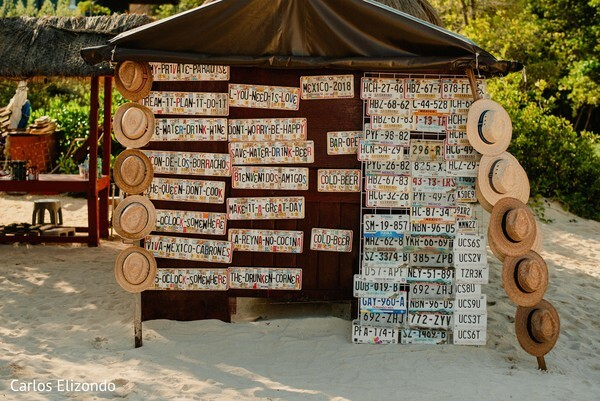 Go to our full gallery to relive every moment! Ifty and I have known each for a few years but were more acquaintances. 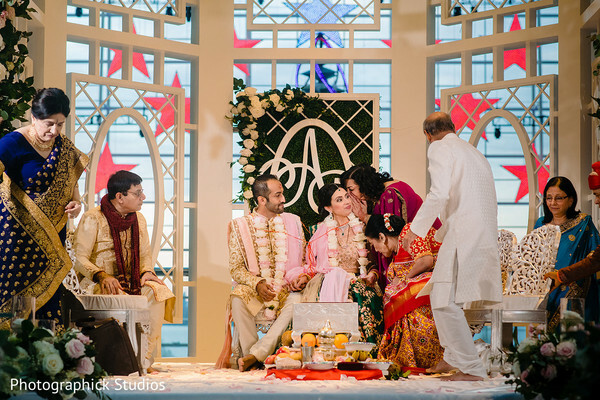 I am a wedding planner and we had done a few events together and knew each other on a personal level. One day we went out for a bite, our one dinner turned into hours of just sitting and talking about everything. I knew he was the one after our first official date. After our dinner, we decided to walk over to the beach (it was a beautiful summer night) we went to the beach around 10:30 pm, around 11:30 pm it started pouring! We ran for shelter, but as we were running towards the covered area we stopped for a minute in the pouring rain and stared at each other. In that minute I just knew, that he was going to be the man that I spent the rest of my life with. I knew that I wanted to enjoy every single thunderstorm, every single summer shower with him. Walking down the altar and locking eyes with him. 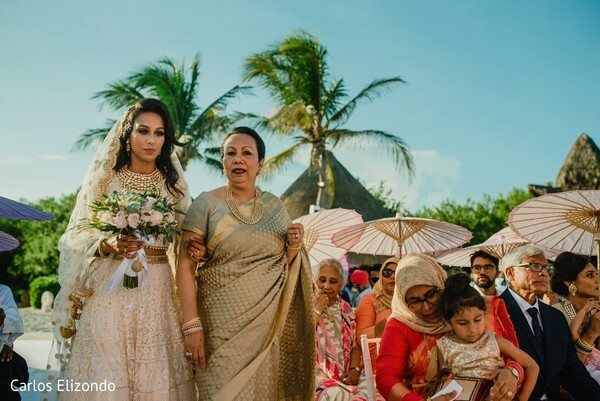 I remember being very nervous walking down the aisle and as soon as I saw him, he started to laugh which gave me all the confidence to walk down the aisle and smile as I was walking. 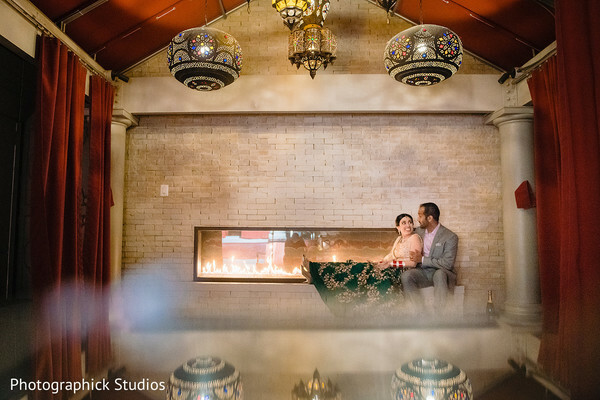 Make sure to come back tomorrow to relive more unparalleled wedding stories! 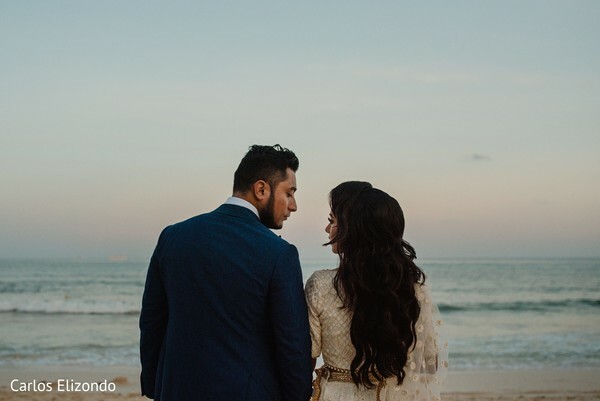 A scenic Cancun beach made the perfect backdrop for Sara and Ifte's union! 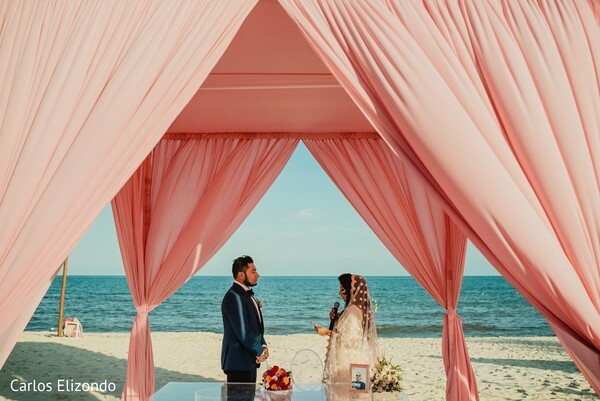 They exchanged vows under a pretty draped coral color mandap in the exclusive 5-star Iberostar Paraiso Beach, a breathtaking beachfront ceremony wedding planned to perfection thanks to Red Carpet Affairs whose planning team collaborated with the newlyweds to bring their vision to life and set it in motion! 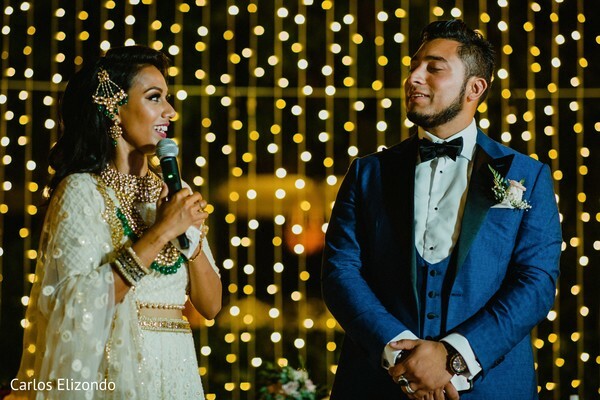 Raja Ifte set some major style goals with an elegant three-piece blue tuxedo from Suit Supply and used a pretty rose boutonniere that accented the look. 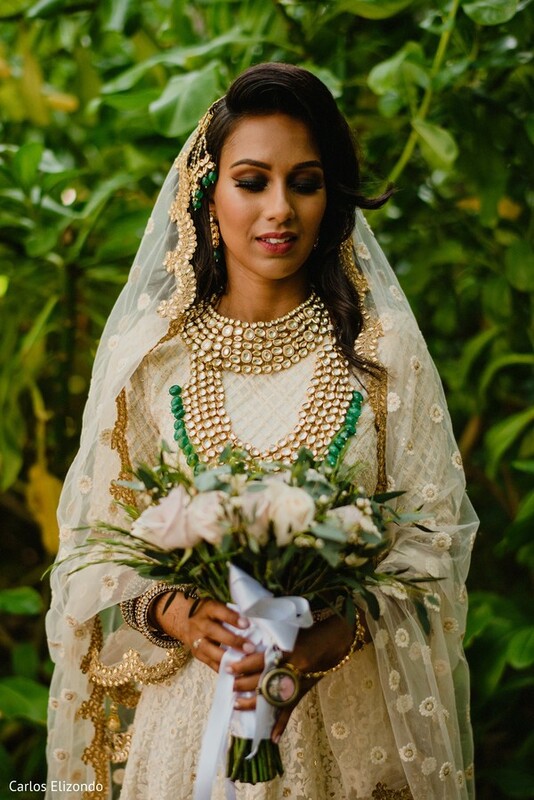 Our lovely Maharani also added some blooms to her look and carried a whimsical bouquet that will make you swoon! 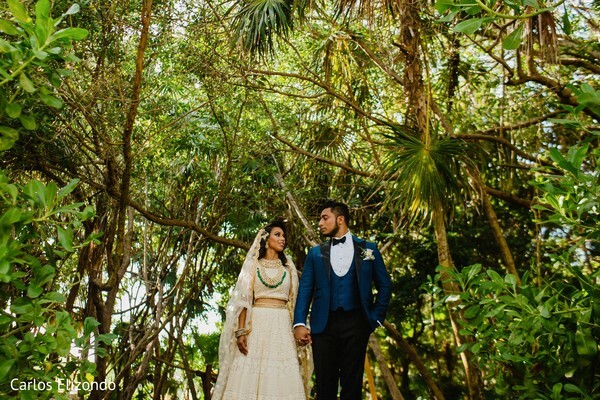 Carlos Elizondo captured it all, from the heartwarming rites of the ceremony in this magical tropical scenario up to the special Mariachi performance that serenaded the happy couple! 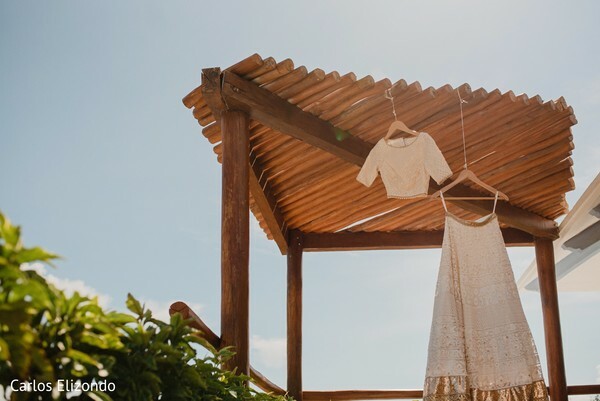 Peruse through the gallery for some more perfect beach wedding inspo! 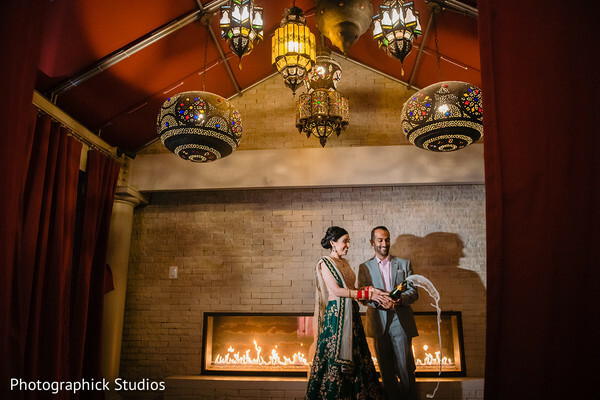 Stay tuned for the magical reception! 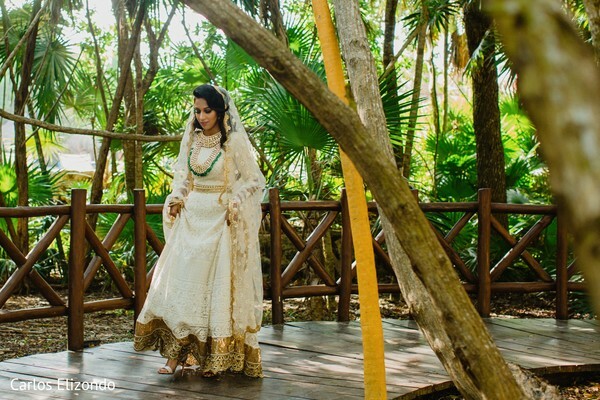 Experience the perfect beach destination wedding along Sara and Ifte! 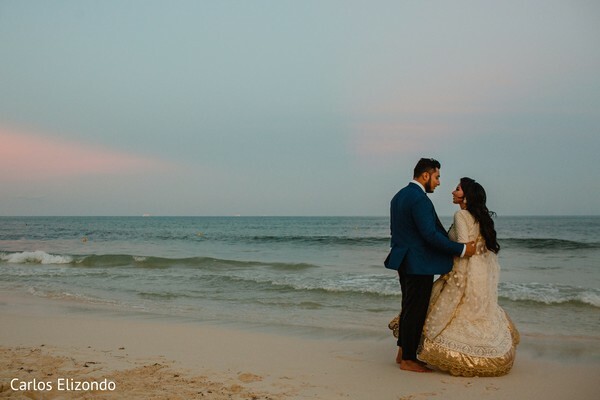 This cute duo tied the knot next to the clear waters and in the white sandy beaches of Cancun, Mexico and we have all the wonderful imagery of their perfect Caribbean wedding thanks to the official photographer, the amazing Carlos Elizondo! 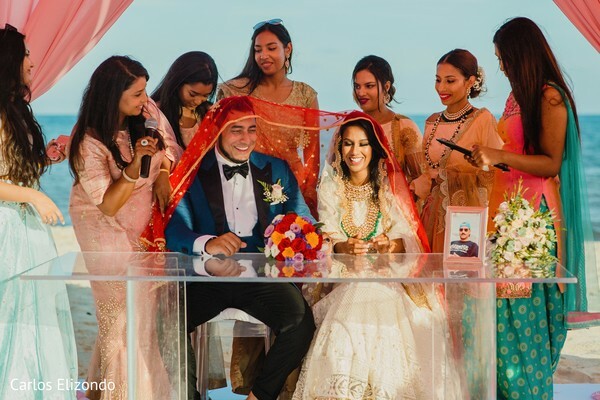 The wedding spree was brought to the beach thanks to the destination wedding experts of Hype Travel; the festivities were kicked off with a holy-themed Holu celebration and continued with a joyful Sangeet you can relive through the highlight film recently featured in our Filmy Blog filmed by Eleve Studio! 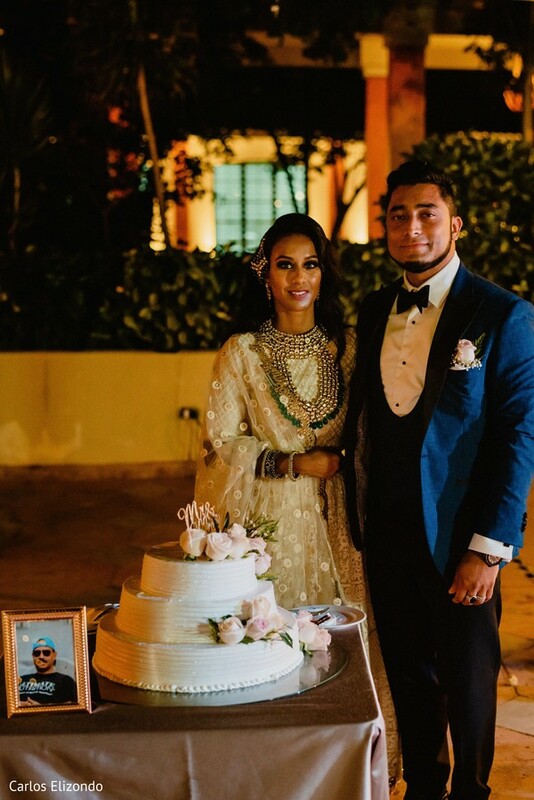 The wedding day arrived and our sweet Maharani Sara slipped into a gorgeous champagne color lehenga design from Poonams Kaurture, she accessorized it with a dazzling gold and emerald Kundan necklace. 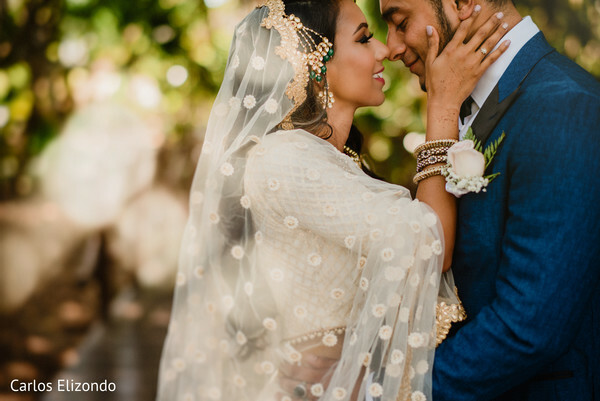 Amore by Adriana glammed up the bride with an edgy hairstyle that she finished off by pinning on a stunning Kundan hairpiece! This lady was ready to WOW her prince! 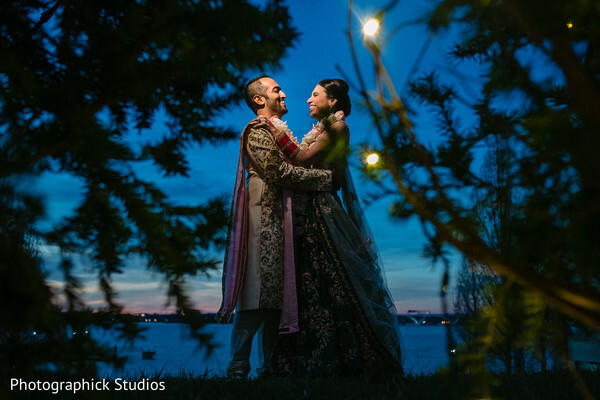 See the magical first look and more in our full gallery! 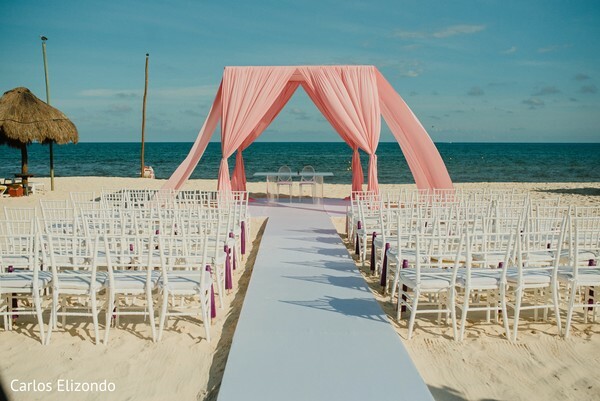 See our next feature and witness the heartwarming beach ceremony. 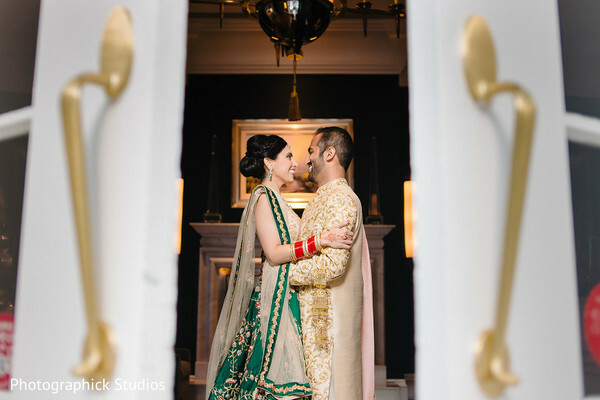 Maharanis, I simply can't stop staring at this enchanting reception's images brought to us by the fabulous Photographick Studios! 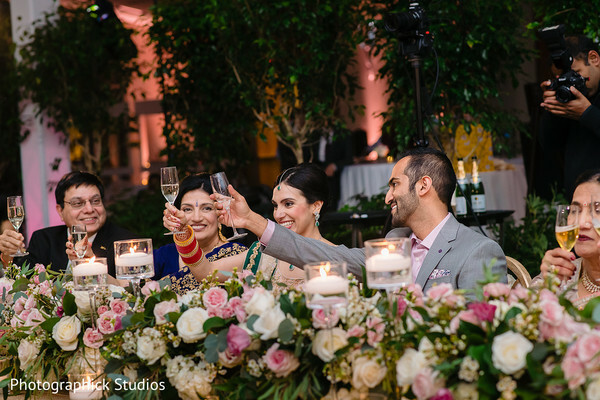 The photo team snapped Anchal and Parag having an intimate celebration with a bottle of champagne as a preamble of their grand party and all the extraordinary garden details that endowed the Riverview Ballroom at the Gaylord National Resort & Convention Center! 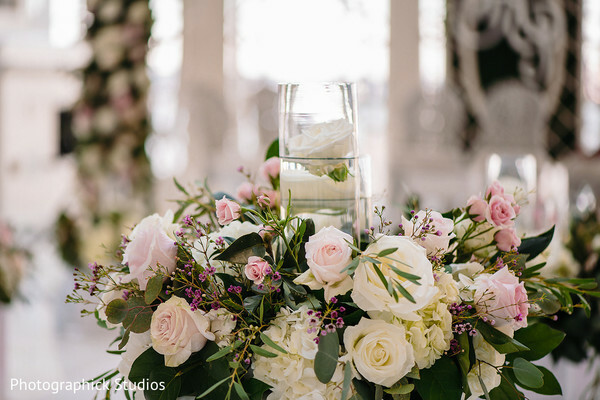 The indoor garden theme picked by newlyweds for their soiree took my breath away! 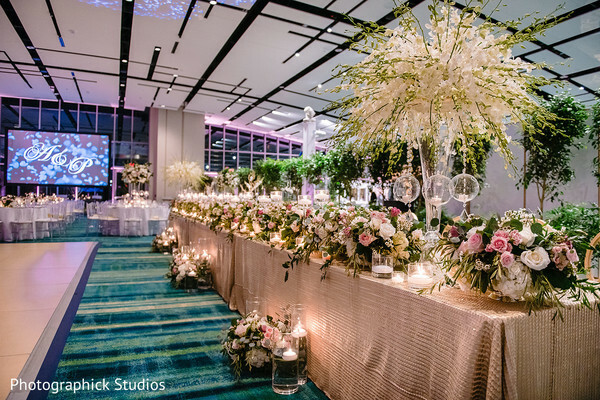 Nivanjoli brought the outdoors in, totally achieving a spring flair decorating the hall with beautiful trees, a splendid long sweetheart table, and romantic centerpieces! 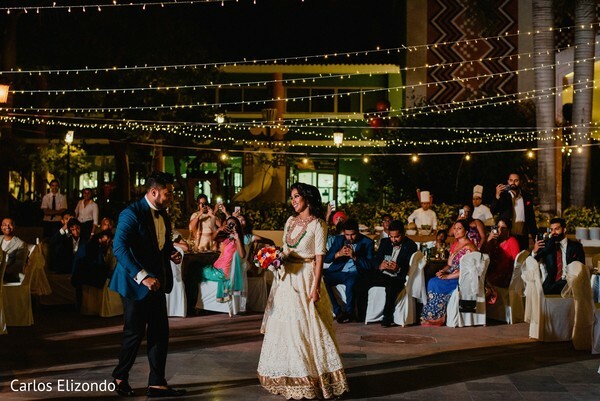 Orchestrated by the highly experienced CG & Co Events, this unforgettable celebration had the leading entertainment of Planet DJ Productions as the providers of the tunes and beats while the culinary team of IndAroma was the master behind the excellent traditional food! 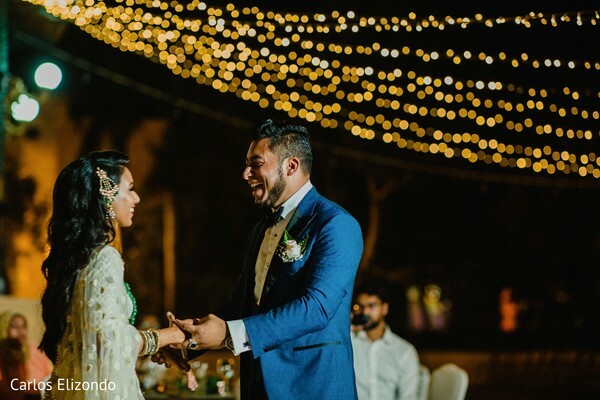 Check out all the best moments of Anchal and Parag all over at the gallery! 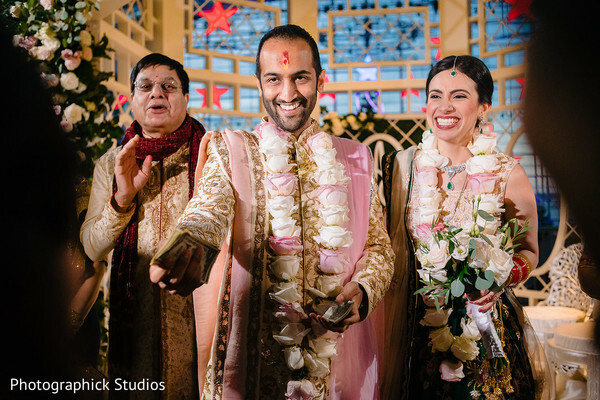 My family and Parag's family have known each other from the southern Maryland Indian community since 2002. We were acquaintances for years. The extent of our conversations were “hi” and “how are you?” for 13 years. 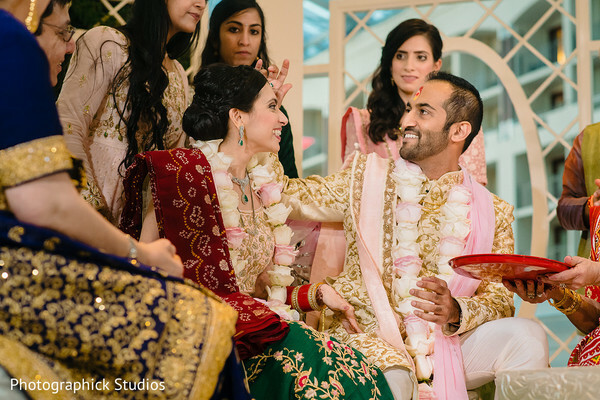 In April 2015 during my sister’s wedding, I talked to Parag and said we should hang out sometime since I know his siblings so well, but not him. I randomly received a text message from Parag in November 2015 during the week of Thanksgiving asking if I was free to hang out. I said I was available on the Friday after Thanksgiving. Parag drove to pick me up that Friday from my house, and we went for dinner at Bollywood Masala. Our dinner lasted for 7 hours, and I told my mom I was going to marry Parag the morning after our dinner! Parag and I were flying to Chicago for Christmas. On the way to the airport, we stopped in DC to see the national Christmas tree. Parag proposed in front of the tree, which is where our second date took place. We love this tree and have made it a tradition to buy the White House Christmas ornament each year. 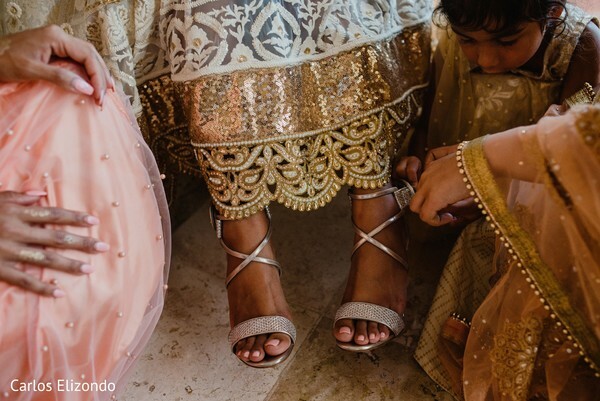 Selecting a bridal lengha took a lot of time! 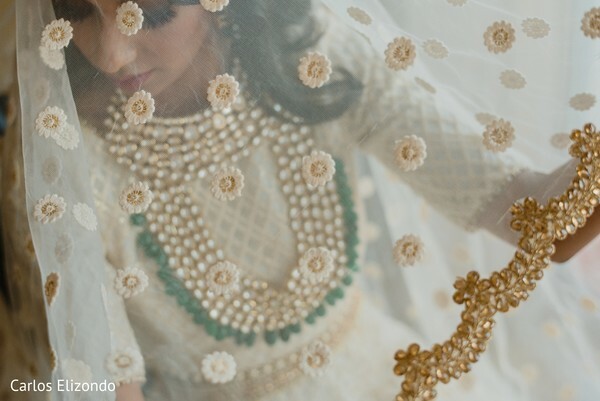 I knew I did not want to wear the traditional bridal lengha so started researching bridal designers online. 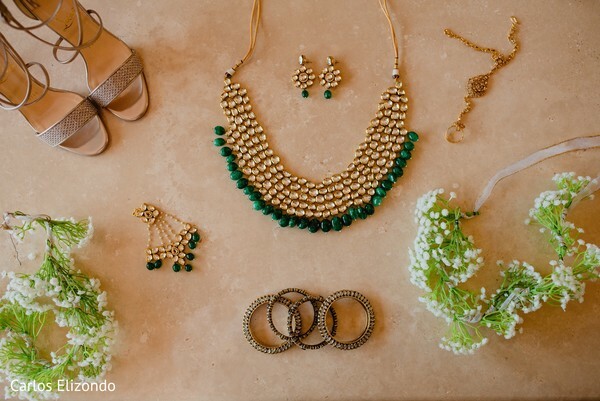 Since our wedding was in December, I wanted to wear the color emerald green. 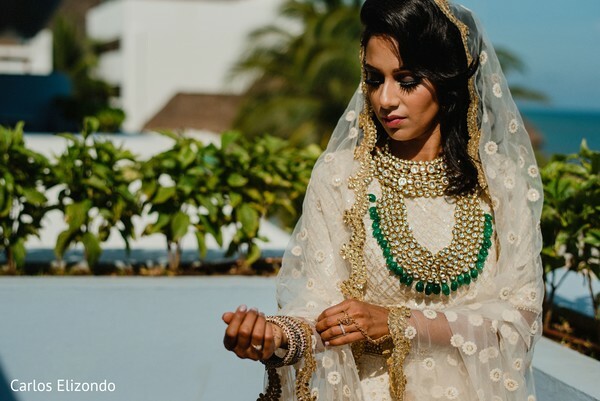 I consulted with a designer in Mumbai and had many lengthy discussions on how to incorporate this color into my bridal wear. 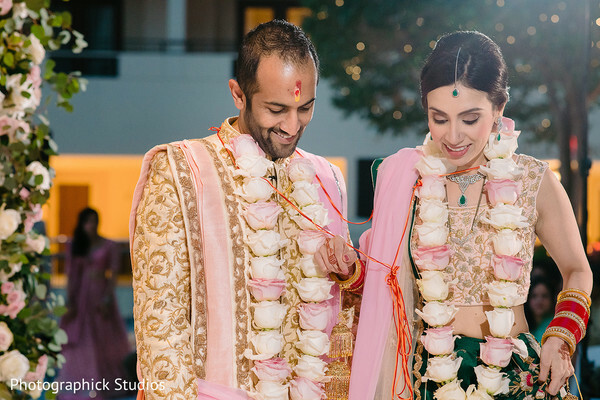 My all-time favorite color for clothes is baby pink/blush pink, so we collectively decided to put together a bridal lengha with the color combination of emerald green and blush pink. Additionally, I really wanted champagne gold incorporated with this outfit but had already selected my jewelry, which was white gold. Therefore, we decided to integrate champagne gold and silver into the handwork. The food carts! 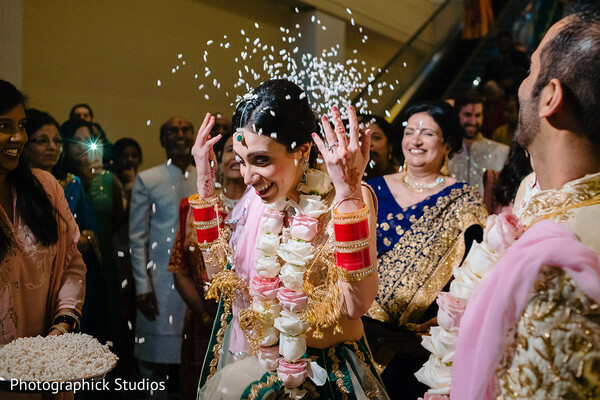 We had 5 different cuisines at our wedding: Thai, Mexican, Indo-Chinese, Indian, and Italian. Each station had a name like Punjabi Haveli, Thai Palace, Italian Grotto, Bombay to Beijing, and Mexican Rivera. Parag and I had spent so much time on getting these food carts made and are so happy everyone enjoyed the food options! Additionally, guests loved the gold oval bar we had rented during the reception. The bar was gigantic, and because of its size and number of bartenders hired, there was never a line to get a drink. YES! 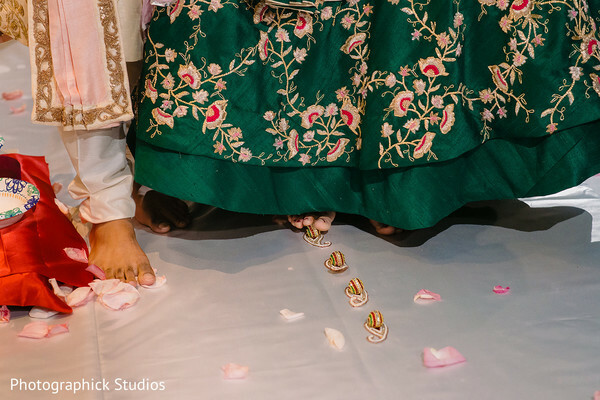 Walking down the aisle with my dad and looking at Parag at the mandap was the best moment of the day! I felt so many emotions all at once it was truly incredible! YES! 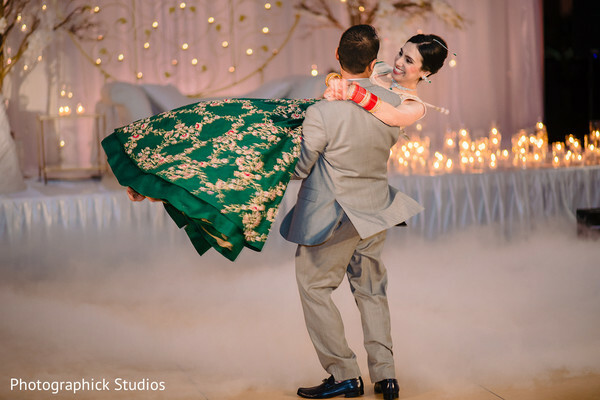 Do not take the burden of wedding planning upon yourself! It is your wedding, and you should enjoy the entire journey. Delegate to family members and close friends. Enjoy the day, and do not worry if everything is executed as planned. One thing or another will happen, but it is best to let someone else handle the obstruction-not you! Most people will not even notice if your plan is not executed perfectly. We loved our pastry chef and cake. 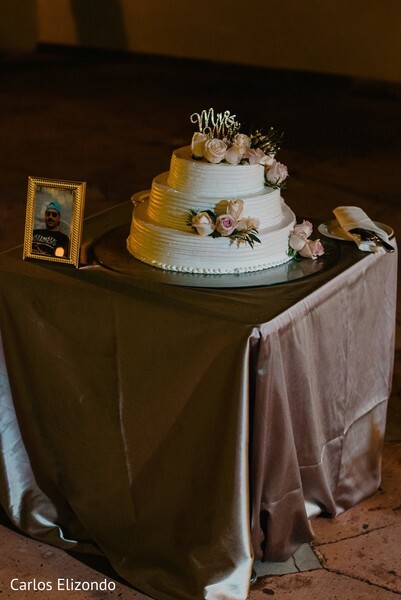 Our cake was a tiered cake, but it had a lot of texture and layers, so it unfolded like a rose. We also loved the Riverview Ballroom in the Gaylord National Resort. 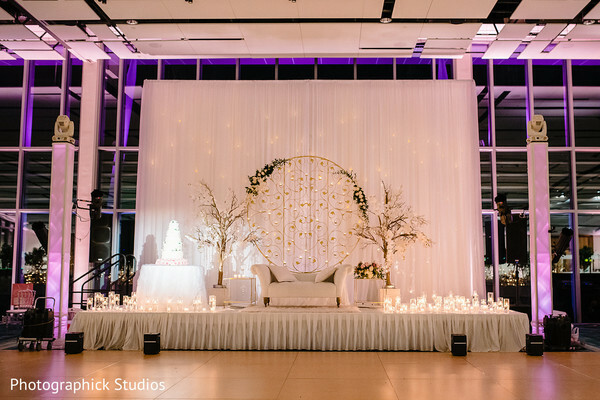 It gave a very outdoor feeling with floor to ceiling glass windows instead of an enclosed ballroom wedding. The view was incredible, and the Ferris wheel looked awesome at night. The decor for our wedding and reception was gorgeous. We wanted an indoor garden theme for our wedding ceremony. 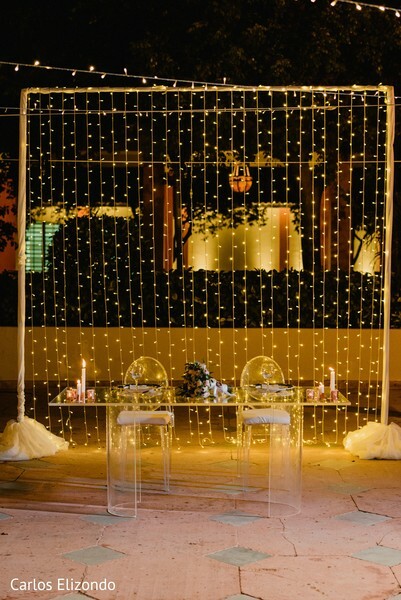 For the wedding reception, we wanted to continue the indoor garden theme but also added a romantic vibe with hundreds of candles on the tables and stage. Also, at the reception, we rented trees and planters to divide the ballroom in half. We used one half of the ballroom for cocktail hour and the other half for the reception. This allowed the cocktail hour to flow with our indoor garden and candlelight theme instead of in an enclosed hallway. Come back tomorrow for more wedding fun! 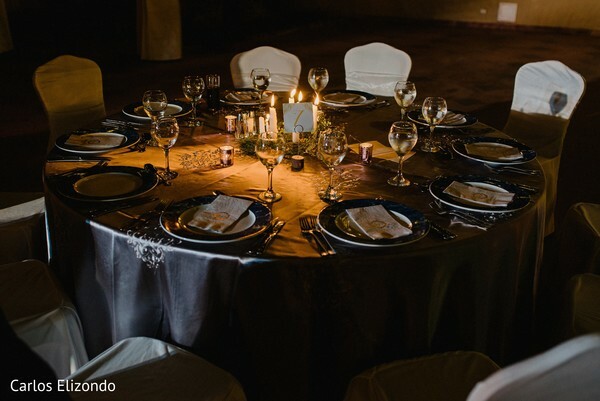 Photographick Studios, IndAroma, Planet DJ Productions and CG & Co Events are members of the Platinum Guide. Love what you see? Explore their portfolios. 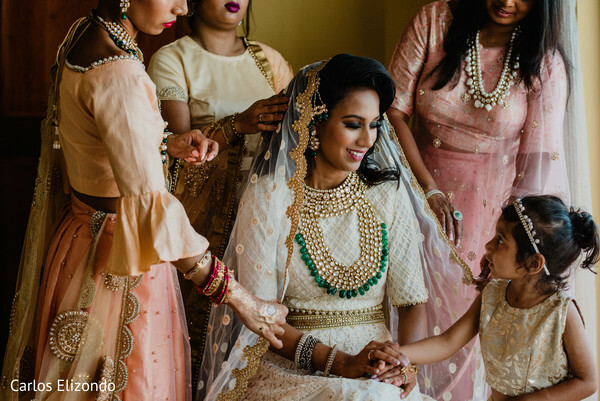 Anchal and Parag's Indian wedding is a story pulled from a fairytale, and trust me, ladies, every image is worth watching! 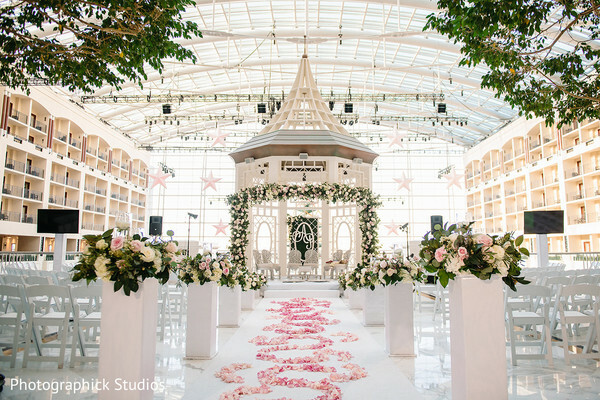 Photographick Studios bring us through their beautiful imagery the timeline of the splendid ceremony that bonded the life of today's lovestruck couple inside a majestic glass atrium of the Gaylord National Resort & Convention Center! 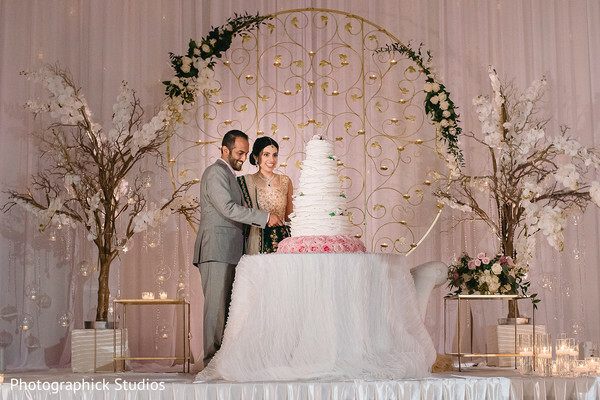 Here, the talented Prabha Bhambri from Nivanjoli built a wonderful indoor garden theme and ensured every detail of the "wedding in bloom" theme with a glorious garland decor for the gazebo and a long line of sweet floral pedestals that flanked the aisle and also filled the ceiling with wonderful pink shooting stars! 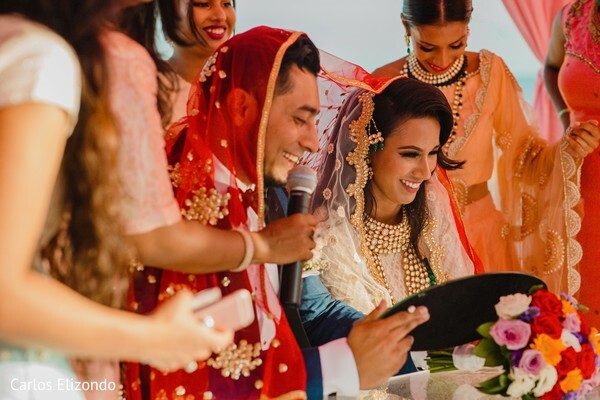 CG & Co Events' luxury wedding planning team did an excellent job guiding the couple step by step through the planning process and taking the lead during the chore of the celebrations! And it looks like the hard work paid off! 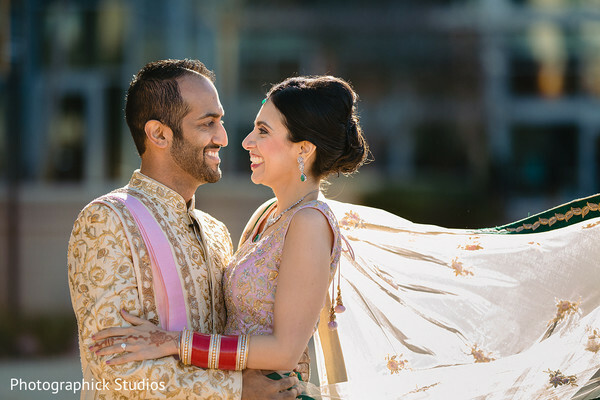 More adorable portraits of these sweethearts during their dreamy "I do's" in our complete gallery! 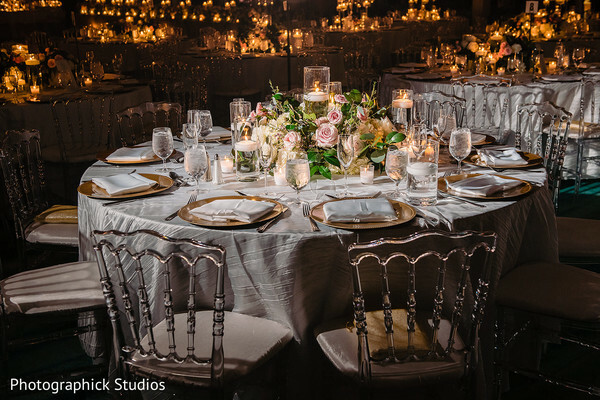 You won't want to miss the lavish reception on the way!